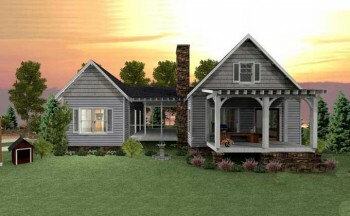 The Serenbe design is a 2 story 4 bedroom rustic traditional house plan with porches, a 2 car garage and an open floorplan. The family room features a stone fireplace and an open ceiling creating great views and a spacious feel. The master suite is on the upper level with a master bath, his or her master closet and an attached laundry room for convenience. The exterior of the home has rustic materials and craftsman details blended with a traditional look that will make for a great looking home.